Retiring to a tropical island or a cabin by a mountain stream sounds idyllic, but just remaining comfortably in their current homes is the goal of most Americans. That was the dream that prompted Priscilla and Stuart Schube to call interior designer Adele Cohen Segel, ASID, for their fifth, and most important, project together. 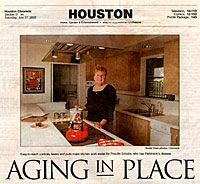 As published in the Houston Chronicle on July 27, 2002. Click here to read the full article.